So after my amazing dinner at Barbuzzo, which I devoted a whole post to, I decided that I needed to recreate this delicious salad that I had. The salad was Roasted Beets with Kale, Grapefruit, and Goat Cheese with a Pistachio Pesto. The combination of the flavors was so incredibly different that I just had to veganize it and make it immediately. I would like to report that my first attempt to make the salad was a SUCCESS! Thankfully the cleanse left my taste buds in prime working order so that I could mentally take notes to plan what I might need to make this at home. A typical pesto includes basil, pine nuts, olive oil, and lots of parmesan cheese. Not very vegan friendly. I swapped in a little bit of nutritional yeast for a cheesy flavor and extra nutrients (like B-12), and used some arugula for a peppery bite. Here is what I came up with and man…it is delicious. Preheat oven to 425. Rinse beets, making sure to remove any excess dirt. (They live underground so fresh beets are dirrrty — like Christina Aguilera.) Pat dry with a paper towel, place on a foil-lined cookie sheet, sprinkle with salt, and drizzle with EVOO. Fold the aluminum foil around the beets to create a pouch. Roast in oven for 30-45 minutes, or until a fork slides easily into the beets. Once cool, the skin of the beets will easily slip off. Add basil, arugula, garlic, pistachios, salt, nutritional yeast, and lemon juice to a food processor. Blend together until mixed into a puree and slowly stream in the EVOO while the food processor is running. When the mixture is thick and dense, but well-emulsified, scoop into a bowl and set aside. Line up kale leaves and roll into a cigar shape. Slice even sections of the “cigar” which will leave you with a chiffonade cut. Here is a great tutorial if you need help with your knife skills. Place in a medium bowl, drizzle with vinegar, squeeze lemon juice, and sprinkle with salt. Set kale aside. Slice wedges of grapefruit and remove the peel, seeds, and outer white pith. 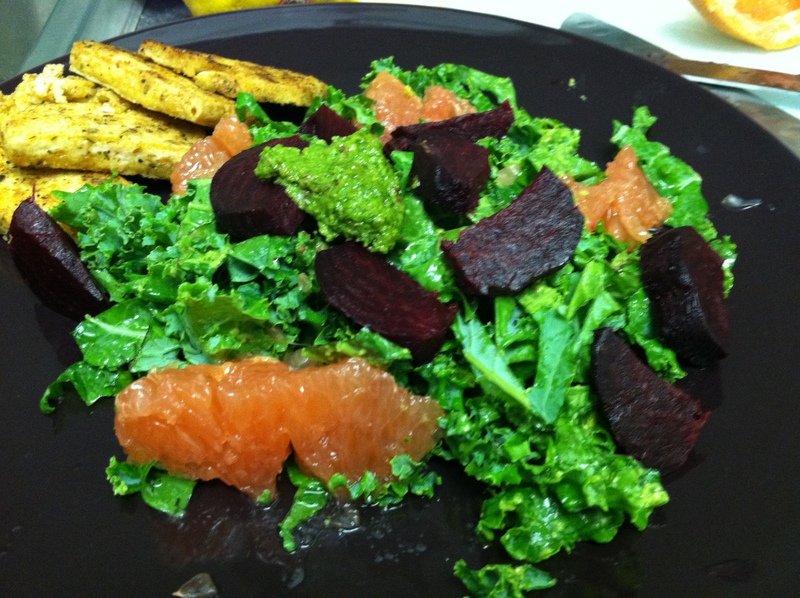 Squeeze the excess juice over the kale and cut the wedges of grapefruit into smaller segments. Place a heaping teaspoon dollop of pesto atop the kale and mix together making sure to coat all of the greens. The pesto will be pliable with the addition of the vinegar and grapefruit juice, however if you find the pesto to be too sticky to coat the greens, add more grapefruit juice. 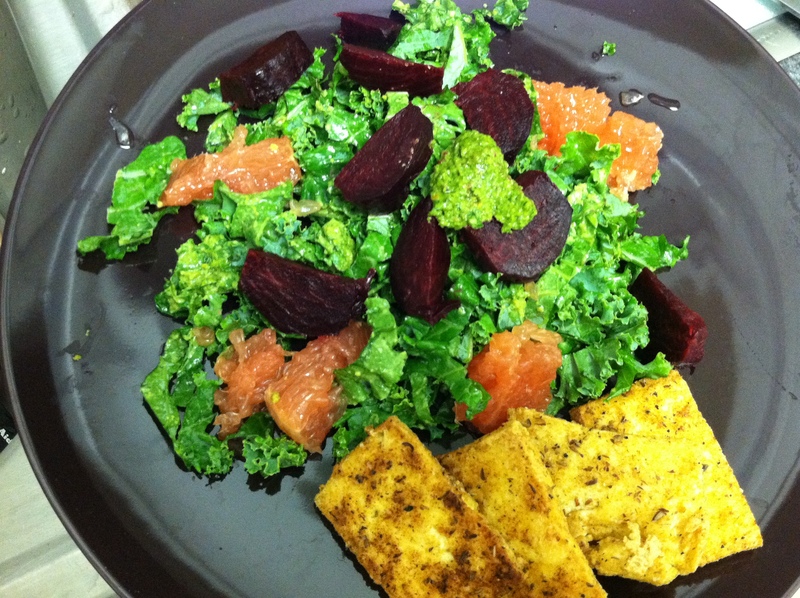 Place the kale on a plate and top with sliced beets and grapefruit and a small dollop of pesto. Enjoy. As you can see, I served my salad with crispy tofu nuggets. I’ll write up the recipe for that after I do some more tweaking. Here’s a picture of a perfect bite. And you can see that lovely chiffonade of the kale. Trust me, the cut of your vegetables makes a HUGE difference in the way that your taste buds register them. Not to toot my own horn..or Barbuzzo’s but, this salad is amazing — the sweet earthiness of the beets and the dark green flavor the kale is contrasted by the rich creamy and garlicy pesto and the sweet citrusy grapefruit. Obviously I needed a sweet to go with this meal, and after my boss turned me on to chia seeds, I’ve been dying to use them. Chia seeds are a miracle food that originated in South America with the Aztecs and Mayans. They are known to give energy, provide sustenance, but most importantly they are a SUPER food. They are a complete source of protein and contain tons of fiber and are a great source of Omega-3 fatty acids (which is something that vegans can have a hard time getting). One of the most important things about chia seeds is that they are extremely hydrophilic, which means that when they are exposed to a liquid, they soak it all up and balloon in size. This makes them perfect for a pudding. I found some great looking recipes for Chia Seed Puddings, and obviously put my own spin on it to create something fabulous. 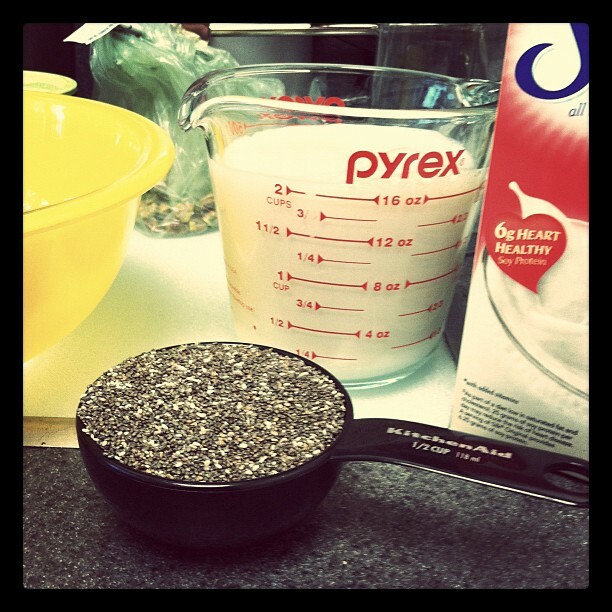 Stir the chia seeds and soymilk together, and refrigerate for an hour until gelled and set. This is what it looks like when set. When set, stir in sucanat and vanilla extract. Spoon into individual bowls and top with a sprinkle of cinnamon, toasted coconut, berries, and a couple grates of cardamom. Enjoy.